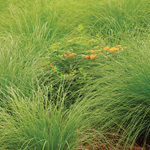 The foliage gets to be about a foot tall while the flowering stem can reach up to three feet. This clumping sedge grows in a wide range of conditions and provides food and cover for wildlife. It is named for an amateur biologist from the Kansas City area. 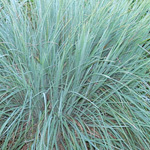 Seed: Many sedges seem to have a high dormancy, including Bush's sedge. To break the dormancy, sow seed between October and February so the seed is exposed to cold moist conditions over winter.